John Fettiplace was the second son of Thomas Fettiplace Esquire of East Shefford House (Berkshire) and his wife, Beatrice, a minor member of the Portuguese Royal family. As a younger son of the family with little prospect of inheriting much land, John may have been sent to London as a mercantile apprentice. He evidently had his sights set a little higher however. Whether his mother had influential connections at Court or the monarch simply recognised his Portuguese Royal blood, by 1455, John had managed to become a member of the Royal Household and Esquire to the Body of King Henry VI. No doubt, due to his acquaintance with the Portuguese language, King Henry entrusted John with the carrying and presenting to King Alfonso V of Portugal "a certain gilt garter, ornamented with pearls and flowers" and the associated robes of the Order of the Garter, for which service he received £40 "which the Lord the King commanded to be paid to the said John for his costs and expenses in carrying the said garter to the King of Portugal." The cost of this garter was considerable, the King paying no less than £66 13s 4d (a sum equivalent to several thousand pounds today) for it to Matthew Philips, the London Goldsmith. John was therefore mixing with rich London merchants as well as well-connected lords and it was probably around this time that he established his own business as a wool merchant in Lothbury in the City, where he became a member of the Drapers' Guild. Selling Berkshire wool in Flanders was a lucrative industry and brought John enough reward to allow him to purchase the manor of New Langport in Kent. As lord there, he seems to have contributed to the repair of the cloisters in Canterbury Cathedral where his arms may still be seen. John was probably also able to buy out his brothers from their father's Shefford estate. Furthermore, in the late 1450s, he found himself a bride in Joan, the daughter of Edward Fabian (and almost certainly some relative of Robert, the Chronicler), a city widow with four young children. Her late husband had been the respected stock fishmonger, Alderman Robert Horne, who, as a one-time Sheriff of London, had been imprisoned in Newgate by Jack Cade's mob but managed to buy his life with a vast ransom. The fortune which John amassed during his residence in the capital was, no doubt, partly derived from this advantageous marriage. The couple had five children together. The family appear to have lived only seasonally in East Shefford, but it was almost certainly John who commissioned the sumptuous monument to his parents which stands in the tiny church there. Upon his death, in late August 1464, he left money for it to be enclosed behind railings as well as sums for the parson to pray for his soul and to give alms to the poor. He was buried in St. Margaret's Church, Lothbury, in the centre of the City of London, according to his last instructions, and his monument existed there until in was destroyed in the Great Fire. It is not known if John played any part in the notorious War of the Roses through which he lived. He would certainly have witnessed numerous troop movements through the City and was probably there when Queen Margaret was turned away from the city gates in 1460. He may have been expected to raise men for the Lancastrian cause, though he would have to have been careful because London was largely a Yorkist city. It is doubtful that he would have taken up arms himself, though he did die at a relatively young age a few months after the Battles of Hedgeley Moor and Hexham. 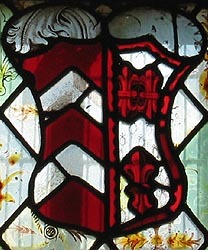 He left four very young sons, Richard, Anthony, Thomas and William, and a daughter, Margaret, who later married Marmaduke Beke of Earley Whiteknights (Berkshire). Each received the vast sum of £400 a piece in his will, while the running of the estates was left in the capable hands of his brother, James Fettiplace of Maidencourt (Berkshire), until they came of age. John's widow, Joan, went on to marry John Estbury of Antwick's Manor in Letcombe Regis (Berkshire) but, when she died, she chose to be buried with her second husband in Lothbury. © Nash Ford Publishing 2005. All Rights Reserved.